if you started with a blank canvas, would you really come up with a boring, labour-intensive, wildlife unfriendly lawn? would you design something that had to have poisons applied one or more times a year? would you design a one-colour - green - monoculture, ideally mimicing an outdoor carpet? 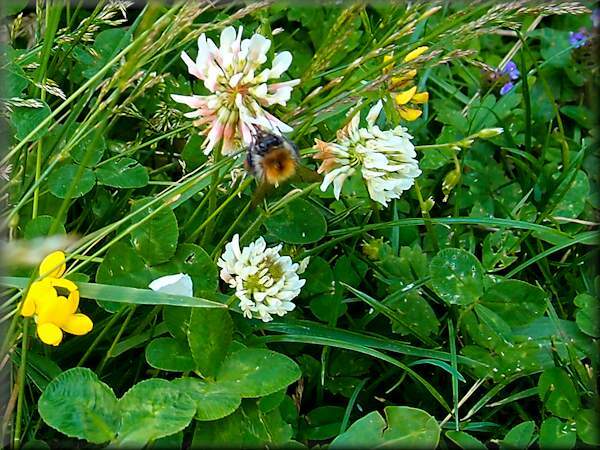 Honey bees, solitary bees and hoverflies enjoy the flowers. The short-stemmed perennials in the lawn are those that will flower soon after/ despite - mowing. The case for butterflies is weaker but you will see butterflies landing on your short-stemmed perennials. What this meadow brown is doing I have no idea. "A lawn is an area of land planted with grasses ... which are maintained at a short height and used for aesthetic and recreational purposes. Common characteristics of a lawn are that it is composed only of grass species, it is subject to weed and pest control, it is subject to practices aimed at maintaining its green color, and it is regularly mowed to ensure an acceptable length ." Note the absence of any mention of nature, natural or wildlife and note the use of poisons (weed and pest control). In the early 17th century, the Jacobean epoch of gardening began; during this period, the closely cut "English" lawn was born. By the end of this period, the English lawn was a symbol of status of the aristocracy and gentry; it showed that the owner could afford to keep land that was not being used for a building, or for food production.